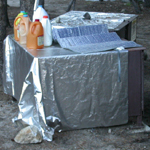 Each campsite and canvas tent cabin in Yosemite, (as well as some trailheads and parking lots), has a metal food storage locker (bear box). This page gives you ideas on how to use one, including some logistics on sharing one in a large group and how to how to try to fit everything into a bear locker. Sizes of the bear-raccoon-coyote proof (if used properly) food lockers are near the end of this webpage. Bears break into vehicles (including car trunks), tent-trailers or tents to get at food or even containers shaped like food seen through the windows, so campers need to put all food, ice chests, toiletries, stoves with spilled food, water bottles that had lemonade mixed in them, trash that didn’t quite get to the bear-proof dumpster, pans and dishes in the bear box. Bears are incredibly quiet when walking and can sneak up and get food off a picnic table that people were sitting at. Injuries to humans include at night when unloading food into the campsite bear box, and the doors are open, and the person gets swatted by a bear that snuck up on them. Black bears are strong enough to bend open an improperly latched bear box door. Clean out your car . . .
You can’t trust your own nose; look around the car, including under the seats for that one old stale, french fry, and in the glove compartment, thoroughly. Take the gum wrappers out of the ashtray. Hey, no heavily scented air fresheners hanging from the rear-view mirror! If the child seat has food spilled on it, scrub it before the trip. Some parks recommend leaving it sitting outside of the car and/or tent overnight or when away from the campsite and not actually using it, so plan ahead for a rain-proof cover. No bottle of brake fluid or spray can of deicer showing, the bears don’t know it’s not food and will break into your car because they see an item the shape of a food container. 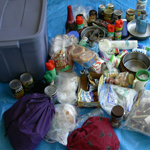 A daypack or backpack also looks like a food container to a bear. Remove night crawlers or salmon eggs from the fishing gear. Air out your vehicle if you eat burgers on the way to the park. Bears have an powerful sense of smell. For example, they can smell a banana in an ice chest in the closed trunk of a vehicle. 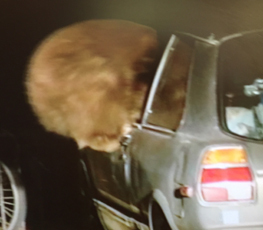 To get at that banana, a bear broke into a door window and clawed through the backseat. When you arrive and as you unpack the open truck bed, leave someone with the gear. Don’t leave a car door open while you go back and forth unpacking. Bears are not true hibernators, so they wake up occasionally and break in to cars and take food off picnic tables in the winter. Playing a bean bag toss game? Yup, a bear ate the beans from bean bags from a game people left out, so either think of a different game to play or put the bean bags in the food locker. That pumpkin you carved for Halloween is also food. The carrot stick you want to use for a nose on a snowman is also food, so use a stick instead. The food storage boxes usually have one or two latches that bears can’t open, but the bears will try! “Six vehicles were damaged by a bear in the Curry Village” (Half Dome Village) “area last week, all vehicles contained food. Overstuffing the box and not being able to really shut it tight. On some models a bear might not get the door open, but a raccoon can reach in through the crack, snag food bags with his paws and make a mess all over the campsite overnight. Assuming that because people are in the site the doors don’t have to be latched all the time is a big mistake. Bears (and lots of raccoons) enter campsites during meals to try to get food off picnic tables, from vehicles with doors open or from bear boxes that weren’t latched. Don’t turn your back on food, keep it within arm’s reach. Don’t put valuables (wallet, car keys, fanny pack, day pack) in a bear box. And if you leave them in your car they should not be showing. Likewise, valuables left on a shelf, table, desk in a hotel room /cabin / cottage that show thru a window are an invitation to a thief. The mini-lock on the tent zipper is useless, animals will just tear the tent fabric. Don’t leave bear box door open beyond the time it takes to get out what you need. Don’t open it and turn away to carry food to the picnic table without shutting and locking it. Don’t leave items sitting on top of the bear box unless you are standing right there eating them, for example. If you are only making and eating a sandwich, for example, you can do the food prep on top of the food locker, shut and latch it and sit down to eat. No, you r-e-a-l-l-y should not leave the door open as you go back and forth from the food locker to the picnic table, even if you are sure you do not see any animals in the vicinity. Raccoons can be especially fast getting in and out of food storage lockers. You might hear ” hey get out of there” from your neighbors just before you hear them banging the food locker door shut. See: camping blunders for more stories. When camping with a large group of people we have found that some complain there is not enough room in their shared bear box for all their gear. 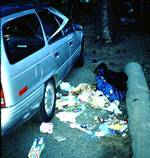 In the summer at Tuolumne, when we often get a group campsite, we have had serious problems fitting everything. 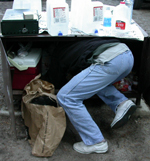 For many years on our winter Yosemite valley trip the Rangers let us use bearboxes in closed campsites in the rest of the campground, but in 2004 a Ranger said we would need to buy more campsites instead and that has been the policy ever since. And no, it would not be a great idea to just sneak your excess food into a bearbox in a vacant loop, if they get more campers and open up more loops, you could lose your food, ice chest, etc. The size of the bear box (most are 35″ deep x 43″ wide x 28″ tall, some are 33″ deep x 45″ wide x 18″ tall, according to the the Yosemite website find sizes for each campground at https://www.nps.gov/yose/planyourvisit/lockers.htm) lets you plan what you can bring. The front opening sometimes has a flange around the inside of the opening. The inside is actually a little bigger. Measure your ice chest in advance. Some mega-quart capacity coolers are 19″ tall and won’t fit in. Plan in advance to use the space available more effectively. This page pictures the smaller boxes, the newer, larger Yosemite ones are slightly less wide, but slightly deeper and ten inches taller. Picture a 33 inch by 45 inch space. Then imagine two ice chests slid into the back of the bear box. Along come more people and they place a stove, two pans, five shower kits of various shapes and sizes, two paper grocery bags of canned/boxed food, a six-pack of soda, a small toiletries duffel bag, a tea kettle, a dish pan with a few things in it and a small shallow box of miscellaneous cooking gear in front of the ice chests. When the people who put in the ice chests need something from them they need to take out all these individual items. When they put them back in they will doubtlessly not put them back in order. At some point the paper grocery bags will get damp on the bottom from leakage from the ice chests or blown in rain/snow and will disintegrate when they are removed. Cardboard boxes that get wet on the bottom can also disintegrate, even over only one weekend. More things could fit if everyone brought their gear in shared small, deep plastic trash cans or other plastic boxes close to, but no more than, 17 inches tall. A typical bedroom waste receptacle could be 9″ by 12″ by 17″ tall and hold quite a few cooking items and toiletry bags. Then more gear could fit, since it would not all be spread out in a shallow layer and all of it could be retrieved and replaced more easily. A big bin, like the blue 23 1/2″ x 16″ by 16 1/2″ tall one pictured below, can hold a large number of single items for multiple people. If a big group does not have all the same menu, they should at least plan some ways to have more space by bringing less. If everyone who wants to make sandwiches brings their own 32 ounce jar of mayo and 16 ounce jar of mustard, we will run out of space in the bear boxes. Share condiments or bring small containers. Likewise, put some cereal in a smaller container instead of each person bringing a full-sized box. Don’t bring a gallon of milk, start with a maximum of a quart and then buy more at the store. You probably don’t need a two pound block of cheddar. Can you bring instant drink mixes and mix as you want them instead of a gallon bottle of punch or lemonade? If you break the eggs for scrambled eggs into a tightly lidded jar they take much less space than in the carton they came in from the store. In the photo below, the jar has eggs, a little grated cheddar, sour cream and chives. It’s ready to be shaken and turned into scrambled eggs or an omelet. And the eggs store more easily in the jar when in an ice chest than in the package they came from the grocer in. The prewashed and precut raw bell pepper, celery and cauliflower in the plastic container lasted for days and take less space than whole vegies. All the food preparation you do in advance means more time to play on the trip. If everyone brought a large container of full-sized toiletries, as in the left of the photo below, they would take up too much space. By bringing travel/sample sized containers of shampoo, lotion, etc. in a smaller bag, as in the example on the right in the photo below, there is room for even a full sized can of spray insect repellent. Tear off the appropriate size and number of sheets of foil you will need, fold and pack them with a few plastic sandwich bags as needed instead of bringing whole packages. Antibacterial towelettes are great to clean hands when it’s just not convenient to trudge to the restroom before preparing a meal. But the whole plastic tub will take up too much space in the bear box, bring a few in a zip-lock bag, or a small bottle of liquid. 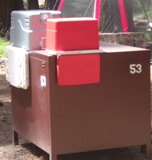 Yosemite rules say to dispose of all trash in the dumpster, not to store it in the bear-proof campsite food storage box. And it probably won’t fit in the box anyway. So, make regular trips to the bear-proof dumpster. Yosemite has recycling bins near many of the restroom dumpsters. At the end of each campsite loop in Upper Pines campground, for example, there are trash and recycling dumpsters, and at the end of some of the loops, a smaller trash-can-sized receptacle for propane canister recycling only. (2016 from the website) In Grand Teton you must store all food/toiletries and empty coolers as well as “cookware (clean or dirty), stoves and grills” in the bear box. The boxes are dark metal and can build up heat inside, melting your ice faster. If you cover the box with something reflective, like the silver tablecloth yardage below, you can save money on ice. ALL MODELS are metal and are noisy when opened or shut. Unless you are careful you can wake up your neighbors who want to sleep earlier or later than you. Yosemite bear-proof food locker latching systems has pictures of how to properly latch a bear box. A good way to wake up the whole campground is to set your car alarm. Then if a curious animal or clumsy person bumps the vehicle at night you’ve succeeded. 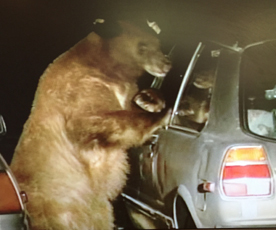 (a car alarm won’t keep bears out of your vehicle). Most Yosemite campsite models measure 35″ deep x 43″ wide x 28″ tall, some are 33″ deep x 45″ wide x 18″ tall, according to the the Yosemite website. 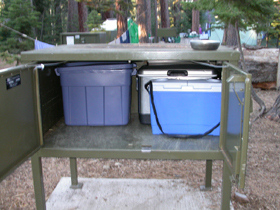 Metal bear-proof food storage boxes in Sequoia and Kings Canyon National Park campgrounds vary from 47″ long x 17″ deep x 17-3/4″ high to 47″ long x 34″ deep x 28″ high to 47-3/4″ long x 34″ deep x 22″ high or 48″ long x 34″ deep x 28″ high. 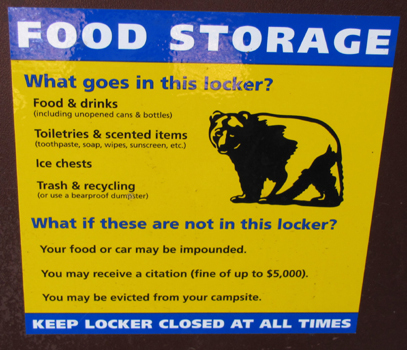 Some California State Parks have campsite food storage lockers. The ones we photographed at Sugar Pine Point State Park were 22 inches tall inside and 20 1/2 tall at the opening. They had two small corner posts at the back inside, so the width of 4 feet is minus a little at the back and the depth (front to back) we measured of 31 1/2 inches is from the front of the box to the corner post. These are opened by putting your fingers into a space on the front and pushing up on the latch. If you push up too far the latch will not open. We recommend bringing a good tent that will not leak rather than sleeping in a bear box. First-timer’s instructions has instructions for beginning snow campers for the De Anza College Outdoor Club winter trip, including info on the logistics of where to pitch your tent, dealing with iced car door locks, staying warm and comfy overnight while winter camping and more. Experienced people will probably pick up a few useful ideas. and links to local Yosemite National Park weather reports.